Our alumni represent the University of Massachusetts Amherst College of Nursing all over the world, practicing in every specialty. 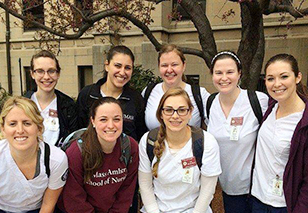 There are a number of ways you can show your pride for UMass Nursing and stay in touch. Our Alumni Newsletter is designed to keep you in the loop! It will keep you up to date on College news, faculty research, student stories, and alumni achievements. You can sign up here and you can submit anything you’d like to see published here. The Alumni Board works to help the college further its mission by offering insight and giving feedback. Find out who the members are and if there are any upcoming meetings. Alumni Events are a great way to network and socialize with fellow graduates of the College of Nursing and learn about current nursing trends. You can check out when any upcoming events may be and read about any events you might have missed here.